Pneumatic and hydraulic systems are based on the behavior of a flowing liquid. 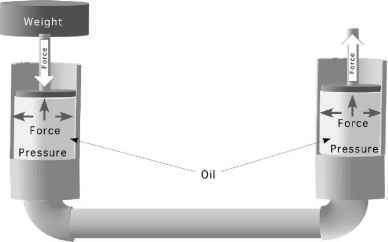 The primary difference is that hydraulic oil is considered noncompressible and air is not. Hydraulic systems are used on more agricultural equipment than pneumatic. Therefore, the remaining discussion will concentrate on hydraulic systems. All pneumatic and hydraulic systems have five required components, Figure 6.10. The heart of both systems is a pump. Many different types of pumps are used, but they have a common job—energize the system. The system also requires a reservoir to store the oil, control valves to control the amount and direction of flow, some type of actuator to perform the work and hoses and pipes to connect all of the components. Other components are included as necessary to achieve the desired performance of the system. FIGURE 6.10. Five required components of a hydraulic system. FIGURE 6.11. Force—the first principle of hydraulics. liquid is transmitted equally in all directions and results in equal force at right angle to the container walls, Figure 6.11. In Figure 6.12, force is used to pressurize the liquid and pressure is used to transmit and change the intensity of the resultant force. Changing the intensity of the resultant force is accomplished by changing the pressure or the area, Figure 6.12. The amount of force produced is determined by multiplying the pressure times the area. where P = Pressure, psi or lb/in2; F = Force, lb; A = Area, in2. FIGURE 6.12. Increasing force using hydraulics. 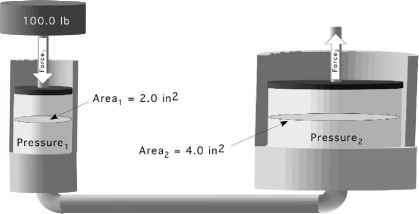 Problem: How much force is produced on the second piston in Figure 6.12? Solution: The first step is to determine the pressure in the system. This example shows that when a 100.0 lb weigh applies force to an area of 2.0 square inches a pressure of 200 lb per square inch is produced. When this pressure is contact with an area of 4.0 square inches, a force of 400 lb will be produced. The increase or reduction of the force is proportional to the area. A 1 x S1 = A2 x S2 Problem: How far will the second piston in Figure 6.13 move? In most mobile applications of hydraulics the pressure is produced by a pump and regulated by a pressure relief valve. In these applications the system pressure determines the force produced by the actuator. When linear actuators, cylinders, are used, the diameter of the cylinder and the pressure of the fluid at the cylinder determine the force produced. The distance the cylinder extends or retracts is determined by the amount of fluid that moves and the speed at which the cylinder extends or retracts is determined by the flow rate of the fluid. Problem: Determine the maximum force possible, amount of extension (in) and rate of extension (in/min) for a 3.50 in diameter cylinder when the system pressure is set at 2,500 lb per square inch (psi), the flow rate is 3.25 gallons per minute (gpm) and the control valve is activated for 15.0 sec. Solution: The process for determining the maximum force produced is the same as the one used in the previous problem. 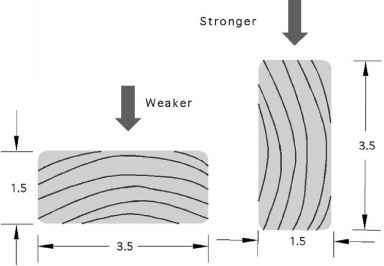 The amount of extension or stroke is a function of the cross section area of the cylinder and the volume of fluid flow. This problem can be solved using units cancellation method. The flow rate of the fluid (Q) and the cross section area of the cylinder determines the rate of movement. This problem can also be solved using the units cancellation method.